The Cirque Plume has grown. The previous show of our poetical buffoons from France was performed in a small big top on a semi-circular stage and the various acts hardly needed any décor other than a structure put together with old iron and cloth. Today, the acrobatic troupe, which is on its way to becoming a box-office success also in the Netherlands, are performing in a bigger tent and on a stage setting, which faces tiers of 1,000 seats, just like in a real theater. The stage is backed with genuine curtains, and the polished wood flooring no longer suggests the traditional circus but almost gives the impression of a theatre. I shuddered with apprehension at the sight on the first night performance of a new Dutch tour. But, as things got underway, you could see that, luckily, under the artistic direction of Bernard Kudlak, the Cirque Plume had not essentially changed in character.  However much the décor has improved, and even how more refined the light and sound have become, the new show, "L’Harmonie est-elle municipale? ", still presents a unique assortment of acrobatics, exploits, mime, conjuring, street-theater inspired clowning and the like, that is all, their very charming, own. Past performances were more rough and ready but the playful atmosphere remains true to itself. The twelve performers still know just what to do to make you feel they are doing it all just for the fun of it. And everyone is still as polyvalent as ever. The girl who performs so marvellously, upside-down and swinging around on her trapeze bar, will be seen, a moment later playing away in the orchestra, providing that music of a many-faceted quality which gives an underlying pattern to the whole show. The guitarist does his rock solo on a trampoline. The man with the big bass drum can do a backward flip on a bicycle. The woman now playing the saxophone has just been dancing a pas de deux with a ghost on the tight rope. And her colleague, after a superb shadow dance will later climb an immense, lengthy drape hanging down from the roof - climbing upwards with such spell-binding elegance as I have never seen in a circus before.